Beauregard was married to Marie Antoinette Laure Villeré one of the most prominent French Creole families in southern Louisiana with whom he had three children: René, Henri, and Laure. His wife, Marie died while giving birth to their daughter, Laure. Beauregard doted on Laure and he cherished her. Laure Beauregard was married March 4, 1878, at her father’s home in New Orleans, to Colonel Charles A. Larendon of South Carolina by Arch-Bishop Perche. Charles and Laure Beauregard Larendon had two daughters—Lillian and Laure. Laure Beauregard Larendon died in New Orleans, July 4, 1884, at the age of 34. Her father was heartbroken by her death. 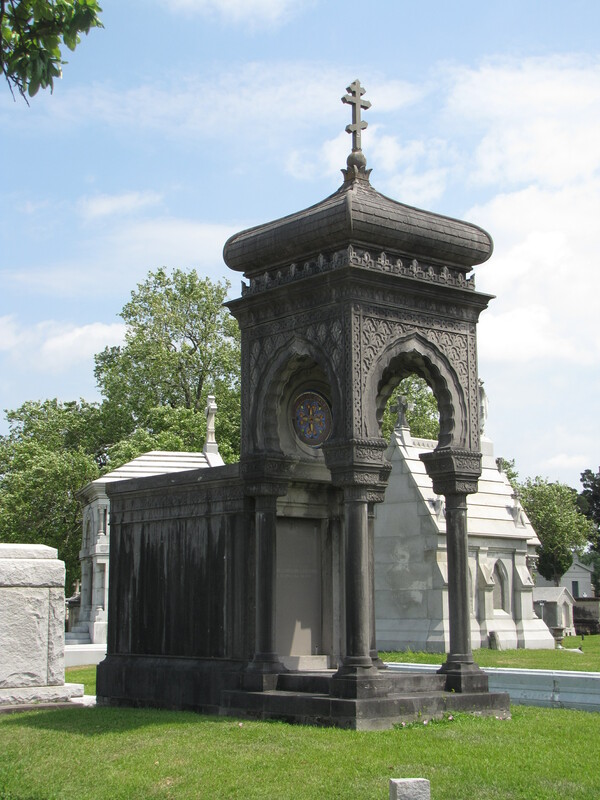 He commissioned a tomb to be built for her in the Metarie Cemetery. Charles A. Larendon died December 26, 1918, he is also buried in the tomb alongside his wife. 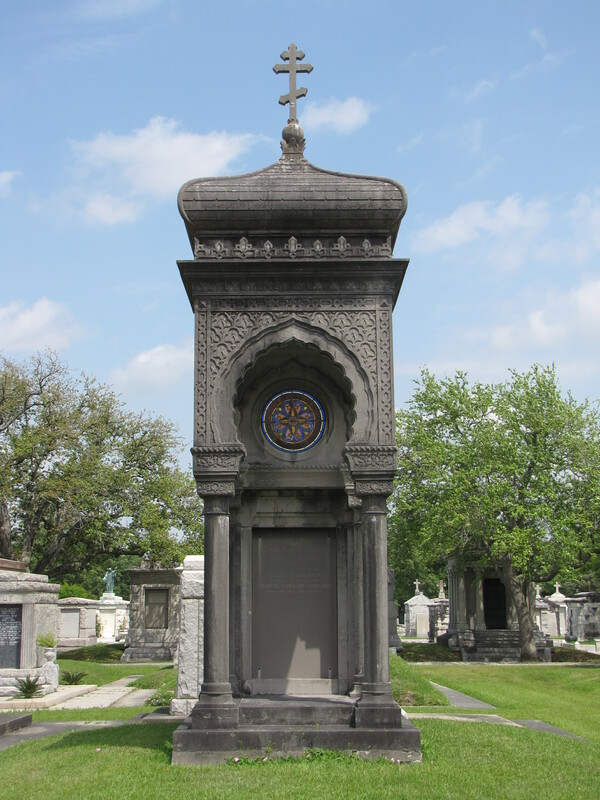 The grand tomb is made of Belgian limestone and was believed to have been quarried and carved in Europe and then shipped to the Metarie Cemetery in New Orleans, Louisiana, to be constructed. The design of the tomb is Moorish Revival—with a modified dome resting on the four horseshoe arches characteristic of Islamic architecture. Punctuating the tomb is a vibrant circular stained-glass window which can be seen on either side of that arch. 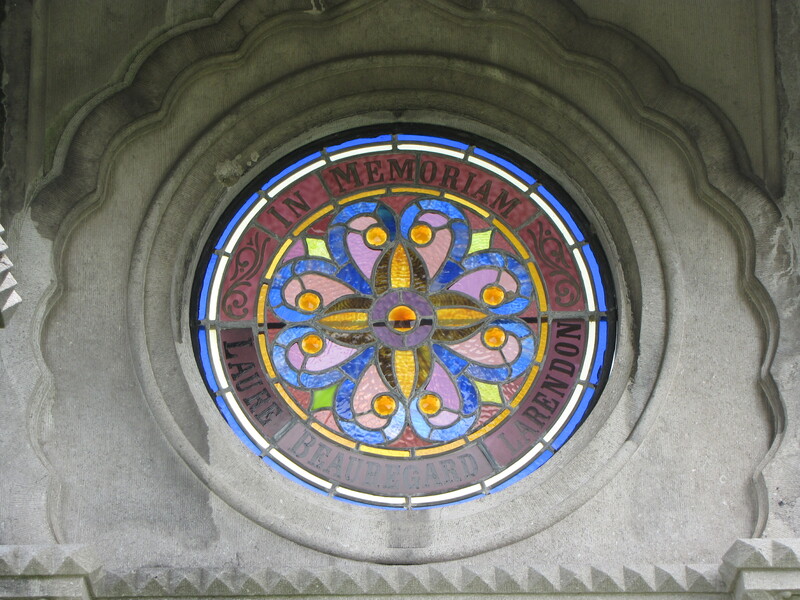 Stained-glass window in the Larendon Tomb. A Byzantine Cross tops the dome on the tomb.The cross has three horizontal crossbeams—the top crossbeam carried the Latin inscription INRI (Iēsus Nazarēnus, Rēx Iūdaeōrum “Jesus of Nazareth, King of the Jews”), the second crossbeam was where Christ’s hands were nailed, and the bottom or third crossbeam was a footrest. The third crossbeam in the Byzantine Cross is slanted with the right side higher slanting downward. According to tradition those on the right would ascend to Heaven, while those on Christ’s left would descend further south to Hell. This tomb is located on what used to be the infield of the old race course. It’s just to the west of the Army of Northern Virginia Memorial. There are a lot of Egyptian-influenced tombs in Metairie, but this one stands out the most because of the pyramid shape.